Why I'd want to share this is beyond me. Why date myself?!? Inspired by a post today from Todd Bliske (My First Computer(s)), I thought I'd follow suit and reminisce about my early computers. A few fun memories. While there were a few steps along the way, I really think of two worth mentioning. 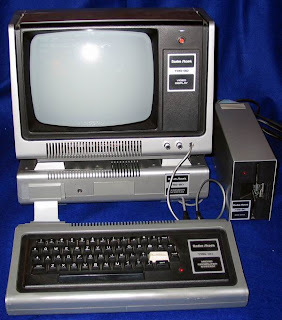 As a teenager, there were many hours of coding pleasure at the keyboard of a Tandy TRS-80 Model I. The one I had was quite similar to this one described very nicely by the good folks over at "Vintage Computer". I hate to think how much time I spent hacking at Basic programs on that thing. See the device under the monitor? The one that's about the size of a dvd player or something like that? That was an expansion interface that enabled the connection of a floppy disk. Before adding that brilliant upgrade, all the persistent storage was handled via cassette! Fast forward a few years to good times in the U.S. Air Force, and things got a little bigger - but marginally more capable. For several years, I had the distinct pleasure of developing on a TI-980B. Check out this awesome front panel. This was a beast, but what a lot of fun. Featuring a switch-initiated ROM bootstrap loader, one would walk up to the machine and execute a flurry of load instructions via those toggle switches, and voila! The beast stirs to life, completing its load from good ole 9-track tape. Armed with a 4 mhz clock and a whopping 16k of dynamic MOS/LSI semiconductor memory (spanning two full-size circuit boards), almost anything was possible. 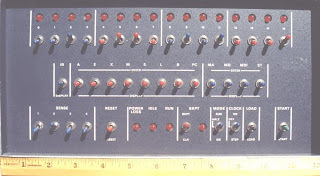 One of the things I remember most was a single DMA port with 6 full circuit boards for I/O expansion. As I recall, there were literally 26 cards in the disk controller. Oh, and that disk. You know the one. Remember these? 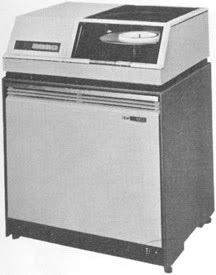 If memory serves, that whirlpool-sized "mass" storage device provided 100mb of storage and involved a pack with 10 platters and 406 cylinders. It looked something like this one at Wikipedia: Removable Disk Pack. In those days (relatively speaking, it's really not that long ago), head crashes were a notable risk. And what a mess that was. Metal shavings everywhere! It wasn't pretty. Not too long after that, things got a little simpler, and I remember going through a Commodore 64 and a Commodore 128 before landing on a machine that was a lot of fun for a number of years. The Amiga was a system truly ahead of its time. Both my kids learned how to use a computer (and fling floppies all over the room) on a proud Amiga 1000. It brings a smile to my face even now to think about my 2 year old selecting and inserting floppies to play his "First Shapes from First Byte" game. I can even still hear the robot voice... "First Shapes from First Byte." Anyone remember the game "Tower Toppler?" Fun times. How about you? What did those early days look like for you?